1st you need to load it, to do this press the red button on the front till the 2 halves pop open and load up with your chosen bait. The only thing you have to remember is not to load the front compartment ( the part with the opening mechanism ) as if you don’t it wont open up. Note here I am loading up with pigeon conditioner normally something that is very difficult to spod out due to its size. once you have it loaded snap the 2 halves together and prepare to send it skywards. Note that on 1st glance it spears that it is smaller than an average spod, I took the largest Korda and Fox spods and filled the spomb from each and there is room for more bait… this thing really can get a lot of bait into the swim fast. The next part is just like a normal spod, except you have not had to pack the back of it with ground bait to stop annoying spod spill. I suggest a 5lb+ test curve spod rod as this thing is really heavy when you have it fully loaded far more than a Fox TB1 spod for example. 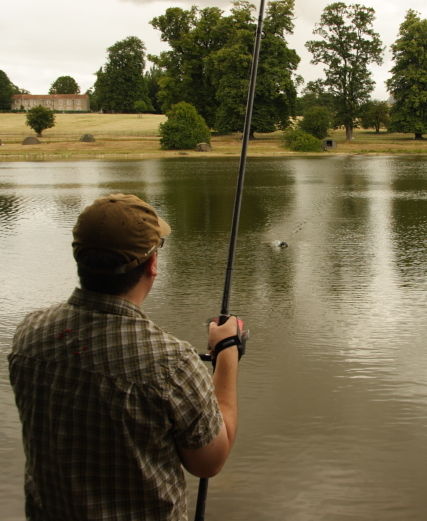 I used my standard 20lb bread straight through on a Fox warrior 5.5lb TC spod rod and a Diawa Emblem Spod reel and had no issues at all however if I was going for massive distance I would be tempted to go for a 50lb arma cord leader or similar to stop any accidents. Of course as with any spodding / braid work a finger stall is essential other wise you will be going to casualty with one finger missing. I noticed immediately that this thing flies like a missile seemingly unaffected by wind and I had to tone down the amount of power I normally put in to a cast and none of the “corkscrewing ” that can occur with normal spods. 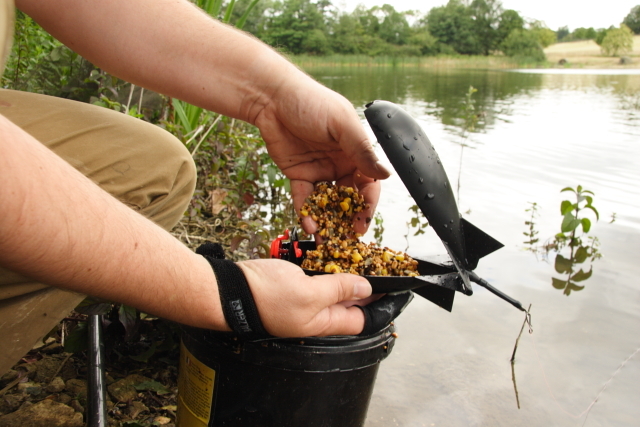 Once the spomb hits the water you can retrieve instantly, there is no waiting around like with a normal spod. Once it hits the water it opens and dumps the load instantly. It doesn’t matter if some of the pellets float, they will leave the spomb 🙂 you will note that the spomb is skipping back over the water ( click for a higher rez pic) and it comes in completely evenly with a nice even tension on the line. The fact that you dont need to wait for the Spomb to empty is really one of the massive advantages, I managed to spod out 3kg’s of prepared pidgeon conditioner in about 20 mins something that would have taken me far far longer with a traditional spod. I also remained relatively un pepered by spod spill, a massive advantage. I love it, you will too. 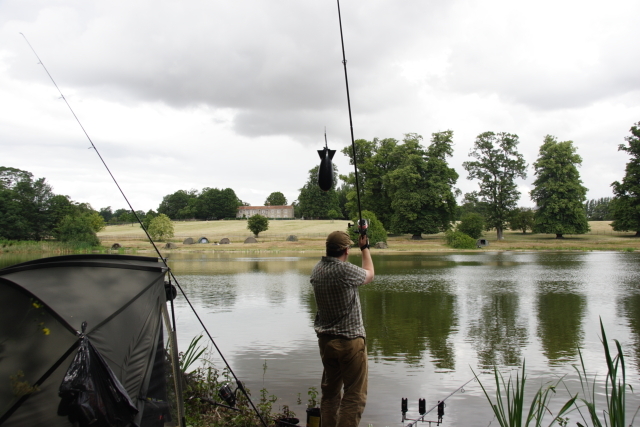 Yes it is not as bomb proof as a normal spod so if you regularly cast onto the other bank or hit rocks / trees then perhaps you need to pack a conventional spod for these occasions but for the rest of us, the spomb makes spodding easy and removes the back breaking effort. Definitely my product of the year so far ! Spombs can be bought direct from www.spomb.com or from Yateley Angling center as well as other stockists, go get one you know it makes sense.